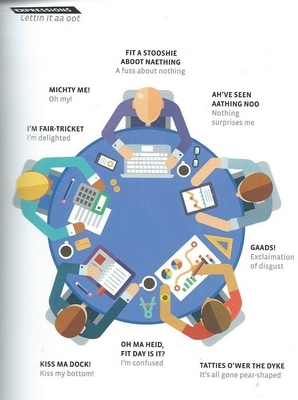 If you dinna ken your Fit Like fae your Foo's yer Doos then dinna fret. There is a solution! 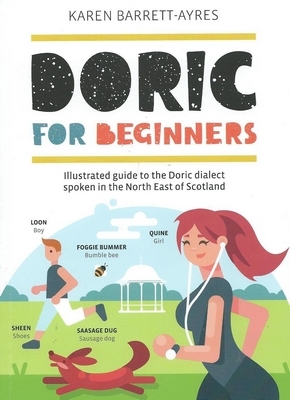 Doric for Beginners is a fun, colourful and imaginative book that gently guides the reader through an understanding of the dialect used throughout the North East of Scotland and beyond. The author, Karen Barrett-Ayres, offers up a unique visual treat that'll soon have you spikkin awa in the mither-tongue. 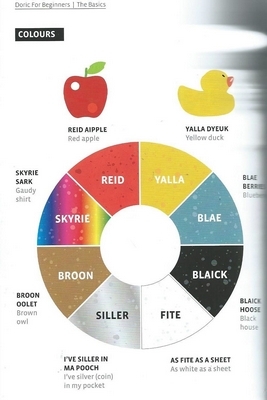 As an example, below is her guide to the colours, ranging from yalla, reid to siller and fite. 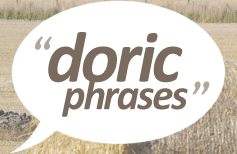 To reinforce her highly-entertaining imagery, Karen utilises examples of Doric words and phrases into everyday use. This includes being in the pub and advising the bar staff to dinna droon the miller. Other sections beyond socialising include dating, food and drink, nature, health, travel and work. Our favourite page, in the image below, will soon have you fair-tricket instead of thinking your tatties o'wer the dyke. I love the local touches that extend to pictures depicting the Duthie Park and the beach with common phrases that can be used or heard there. I'd thoroughly recommend this book to those looking to learn Doric or to native speakers who wish to extend their spoken vocabulary.